Jeff Hubbard enjoys whale watching, but bobbing in a boat and scanning the horizon for an occasional breach isn’t quite adventurous enough for the Belmont native. “I have been on whale watches, and it’s been good, but it doesn’t get my blood going to see a little fluke here and there,” said Hubbard. So he plans to kick the industry up a notch. Soon, Hubbard will give people a new way to view the ocean creatures, one that doesn’t involve a watercraft. He will offer tours that will give people a chance to peer down at whales swimming along the Cape Cod coast from a seat inside a doorless helicopter. “I think this will be a little more exciting,” he said. Hubbard, co-owner and chief pilot at Tuckamore Aviation, said that beginning in April his company will launch trips over the Stellwagen Bank National Marine Sanctuary, a “kidney-shaped plateau” that sits at the mouth of Massachusetts Bay and Cape Cod, according to the National Oceanic and Atmospheric Adminstration. The area is frequented by whales, including the rare North Atlantic right whale. The 2016 right whale season unofficially began last month, with a dramatic increase in the number of whales sighted, according to researchers from the Center for Coastal Studies in Provincetown. Tuckamore Aviation tours, which can be either doors-off or doors-on, will also soar above other areas off the Cape Cod coast, where humpback whales are known to congregate and feed. Hubbard runs the company with owner and president Monica Snow. The two connected in 2013, when Snow, who was once a flight school student of Hubbard’s, decided to take a leap of faith and launch the business. Hubbard said that doors-off aerial tours offer a more exciting experience for thrill-seekers, not to mention a chance to capture “incredible” photographs of the whales from directly above. The tours will be available to anyone over 16 years old “with an iPhone on up to a professional camera,” Hubbard said. No prior training is required of passengers, other than a thorough safety briefing before each flight. 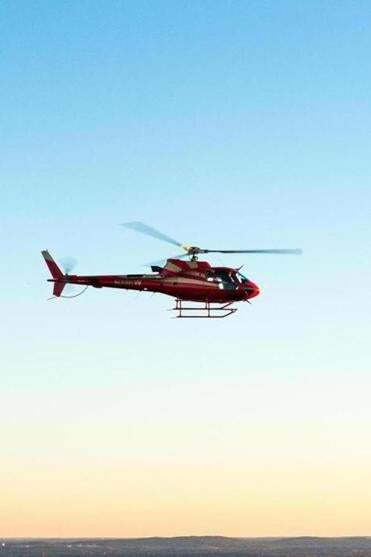 The trips take place in the company’s six-seat AS-350B3 helicopter. Hubbard said he believes the company is the first to offer such whale-watching adventures. “It’s a different experience. You get the wind in your face, and you have great visibility looking down at the whales,” he said. David Gouveia, the branch chief for the marine mammal and sea turtle conservation program at NOAA, said the operation is legal so long as Hubbard abides by certain regulations. According to Gouveia, helicopters and planes observing whales from the sky should stay 1,000 feet or more from the animals. When it comes to North Atlantic right whales, it’s illegal to get closer than 1,500 feet, whether by land, sea, or air, according to NOAA. “As long as it’s done safely from a safe distance, it’s a great resource, no doubt about it,” said Gouveia. Hubbard said the company is still working out some details, but he’s certain there will be a niche market for the alternative tours. Not to mention seals, dolphins, turtles, and sharks, he said.